Philadelphia is the largest city in Pennsylvania and one of the most significant cities in the United States. The number of residents in Philadelphia as of 2013 is 1.55 million people, and this is the sixth indicator in the United States. Philadelphia plays one of the key roles in the history of the United States. As the largest city among the thirteen British colonies in North America, Philadelphia became the capital of a rioting colony and is rightfully considered the cradle of American independence. It was in Philadelphia that the Declaration of Independence was first signed, and then the US Constitution was adopted. Not surprisingly, the main tourist attractions of Philadelphia are associated with its glorious past and are in the historic part of the city. The Philadelphia Museum of Art is one of the largest in the United States. It stores over 227,000 exhibits of Far Eastern and American art, a collection of drawings, engravings, ceramics, textiles, glass, carpets. Every year more than 800,000 people visit the museum. The museum was founded in 1876, in connection with the World Exhibition. In 1919, according to the decision of the city authorities, a new building was built for the museum in the style of neoclassicism, nicknamed the people “The Great Greek Garage”. A total of more than 227,000 samples. Particular pride of the Philadelphia Museum are the works of Pennsylvanian artists, as well as painting of the Newest Time. In front of the museum there is a square in the center of which a horse sculpture with J. Washington stands on the pedestal. Interesting: Annually more than 25 specialized exhibitions are held in the museum, attracting thousands of people from all over the world. If you like buildings with the long history, then you should go to the Carpenters’ The building belongs to the oldest trade guild in America – the Carpentry Company of the City and the District of Philadelphia. The two-story brick building was designed by architect Robert Smith in the Greek style, and was built in the period from 1770-1773. 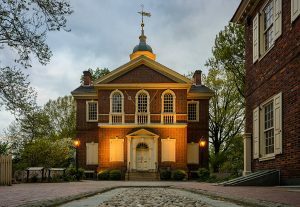 In 1774 the first Continental Congress was held here, at which a resolution was adopted on the prohibition of the slave trade in the colonies. There was a hospital for British and American troops. Many institutions held their meetings here: the Franklin Library Company, the First and Second Banks of the United States and the American Philosophical Community. In 1970 the building was declared a national-historical monument. This famous hall was once visited by the high-ranking officials such as King of Sweden Carl XVI Gustav, Czech President Vaclav Havel, President of Latvia Guntis Ulmanis and the Governor of Texas and President George W. Bush. Interesting: The hall is open for tourists, the entrance is free. Annually, it is visited by more than 150 thousand people from all over the world. 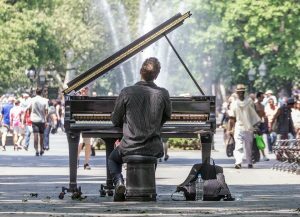 It is must to go to the well-known Washington Square, which was founded in 1682, and was originally called “Southeast Square”. Now, it is a part of the national historical park. It houses the Tomb of the Unknown Soldier and, until recently, the “Moon Tree” grew. 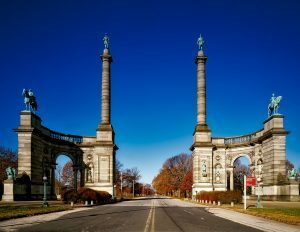 In the XVIII century, the area was used for the walking of cattle and for burial of members of the African-American community. During the revolution, there were burials of dead soldiers from the colonial army, and after the revolution – victims of yellow fever. The neighboring areas developed and became very presentable. The square itself was renamed in honor of George Washington. The square became the place from where the first American, Jean-Pierre Blanchard, in 1793, made a flight in a hot air balloon. In 1952, the square was reconstructed, during which, instead of the originally planned monument to John Washington, a monument was erected to soldiers and sailors who participated in the revolution. Interesting: In 1975, the square was planted “Moon Tree”, grown from seeds brought by astronaut Stuart Roosa from the moon. The tree died in 2008. Strawberry Historic Mansion, as well as various wellness centers, ponds and countless sculptures of Florentine lions. Interesting: In addition to all of the above, it is worth noting the many picturesque views of the park and the abundance of green spaces you will definitely enjoy. Reading Terminal is Philadelphia’s oldest active farming market. It is located in the heart of the city, and every day pleases visitors with a wide range of different products surrounded by historical conditions. Why is it a good idea to include this place in the must-do things? The building of the market is built in the style of the Italian revival, and the interior is striking with decorative plaster and marble decoration. In the market you can try all the cuisines of the world – from the sublime European to the specific Asian one. More than 80 vendors work on the farm market. The market often hosts concerts, and some sellers agree to conduct practical cooking classes. Reading Terminal offers its visitors free high-speed WiFi internet. Enjoying one of the many cafes with delicious soft pretzels with a cup of coffee, you can work on your favorite laptop. 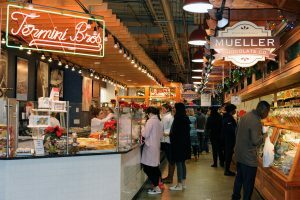 Interesting: Today, the Reading Terminal market is a popular place among city dwellers and city visitors who visit it for exquisite culinary pleasures and the acquisition of unique goods. as well as items made in the Wright brothers workshop and other exhibits. The museum has both temporary and permanent exhibitions. Among the latter: expositions dedicated to the physics of sports, electricity, space, weather phenomena, aviation and many others. Interesting: A large number of exhibits suggest physical experiments. The building is built of red brick, granite and reinforced concrete. On three main facades of black brick a pattern is made in the form of a baseball bat and the word “Philadelphia”. Thanks to a special design in the form of a bowl and a steel frame base structure, the game is clearly visible from anywhere in the stadium. It was originally planned to place a baseball stadium in the center of the city, similar to how it was done in Denver, Cleveland, Detroit and San Francisco. But, ultimately, the stadium was built in the South Philadelphia Sports Complex, on the territory of the old food warehouse. 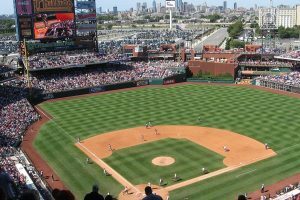 Such a decision upset many sports fans, however, it did not negatively affect the visiting of the games by the fans.As a home ground, the stadium is run by the Philadelphia Phillies team. Interesting: The longest baseball game at the stadium was held on May 25, 2011, and lasted 6 hours and 11 minutes. 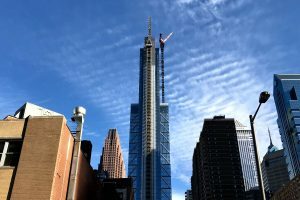 The Comcast Center is a 58-story skyscraper that is the tallest in Philadelphia and is the fifteenth tallest in the US. Huge screen area of 190 square meters, a work of art “Mankind in motion” and cafe “Table 31” made the center a tourist destination. Here, in the glass atrium of the garden, there is the work of Jonathan Borowski “Mankind in Motion”, which depicts the movement of ten human figures in full size on different levels. The skyscraper occupies a leading position in energy-ecological design, as the building is not harmful to the environment. The building has a facade made of glass with low light transmittance, and it itself narrows to the top – this is done so that the tip is less exposed to wind. The building was built in such a way that the water consumption in it is 40% lower than in an ordinary office space. Interesting: There are also many shops and snack bars in the building. Especially popular is the cafe with an interesting name “Table 31” every tourist visits when being here. The Rittenhouse Square is one of five parks designed by William Penn and Inspector Thomas Holm in the 17th century. 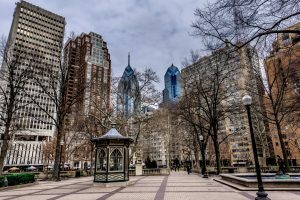 Originally, the square was called the south-west, and in 1825 it was renamed in honor of David Rittenhouse, a descendant of the German immigrant Ulyam Rittenhouse, the founder of the first paper mill in Philadelphia. and the underground Railway Museum. Interesting: Today, the Rittenhouse Square is surrounded by office buildings, residential high-rises, restaurants and hotels. Please Touch Museum, or the Museum “Touch Permitted” in Philadelphia is an entertaining and educational institution for children up to 7-10 years old. If the vast majority of museums there are a lot of signs “Do not touch your hands!”, You can touch here and you need to, the museum is conceived. It was opened in 1976, since that time it moved several times. The first exposition is designed to teach the child social skills, for example: shopping in a supermarket, a kitchen, caring for a garden, swaddling an infant. 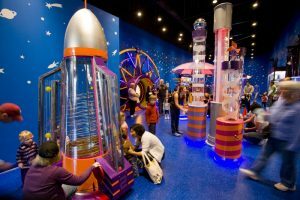 The other part of the exposition is scientific, with unusual, spectacular effects, machines explaining the laws of physics clearly and clearly to the kids. 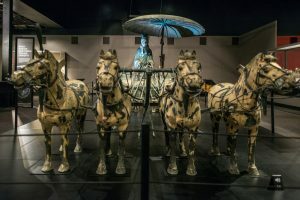 The third type of expositions entertains children, gives them a fairy tale, an adventure as well as the opportunity to stay in it as a character of the tale. You can come with kids and visit the small house from Alice in Wonderland, take part in a crazy tea party, catch gold in a decorative stream, run on a giant piano. Local residents often buy a subscription for an annual visit to Please Touch Museum. According to them, it is impossible to see everything within one day. The children like theater, exhibitions and events of the museum and can spend much time there. Interesting: Many adults also gladly join the games in Please Touch. An ideal place for a family holiday, especially in the cold season. 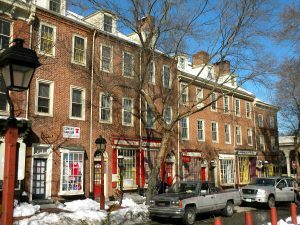 Society Hill is an area in the central part of Philadelphia, which has a great history. This place is the greatest concentration of the original architecture of the XVIII- XIX centuries. The street is paved with cobblestone, and the buildings are built in the classical Greek style. The district is named in honor of the Free Traders Society of the 18th century, which had offices on Front Street, on a hill above Doc’s Creek. Society Hill was located near the Delaware River, the civilian buildings of Philadelphia and soon became one of the most densely populated areas of the city. In the XIX century, the city expanded in a western direction, and the area lost its importance. The condition of buildings gradually deteriorated. In 1950, the first regional and federal program was launched, aimed at the restoration and preservation of historical monuments. Most commercial buildings of the XIX century were destroyed. Historically significant buildings were restored by residents. On the site of the destroyed buildings there were parks, walking paths and modern buildings. Interesting: In 1971, Society Hill was added to the register of historical sites. Wanamaker’s department store was the first department store in Philadelphia and was one of the first in the States. John Wanamaker did not build his trading empire from scratch. Having bought in 1875 the abandoned building of the railway station, he ordered from Chicago the architect Daniel Burnham, with whom they built a magnificent granite building on 12 floors together. the multicolored mosaic abbreviation JW in art nouveau style in the center of the lobby. 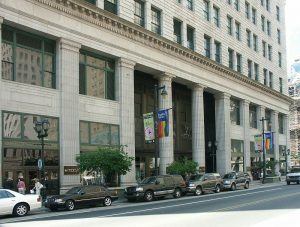 Interesting: In 1995, the building became the property of the Macy’s department store, but it still retains the unique elements and traditions inherent in Wanamaker’s store.